"Land of Living Waters", "Front Porch of the West"
HISTORY: Handbook of Texas Online: "It is named for its location at the confluence of the North and South Llano rivers. Junction was founded in the spring of 1876 following the organization of the county in January of that year. It was originally named Denman after its surveyor, but became Junction City in 1877 and simply Junction in 1894. Junction City won the role of county seat from Kimbleville, an unsuccessful settlement, in late 1876, after the first county court session, probably because Kimbleville was subject to floods. By 1879 Junction City had a drugstore, a livery stable, a sawmill, and more than one general store. The post office, begun in 1876, was moved in 1879 from a private residence to the town square. Kimble County's first newspaper, the West Texan, was published in Junction in 1882. In 1884 the county courthouse, erected in 1878, burned with all the county records. Its replacement, a two-story stone building, was partially destroyed by fire in 1888, but it was repaired and used until the present courthouse was built in 1929. Businessman Ernest Holecamp provided the city's first waterworks with a canal dug from the South Llano to Junction in 1895. In 1896 a dam was built on the South Llano to provide power and water to the city and irrigation to surrounding lands. Four Mile Dam, a more permanent and extensive dam and irrigation system, was completed in 1904. Junction had a population of 536 in 1900, 800 in 1910, and 1,250 in 1920. Between 1910 and 1920 the automobile came to town. The first filling stations opened around 1916 or 1917. By the early 1920s the livery stable had closed, and Junction had graveled its streets and installed electric street lights. By the mid-1920s good highway connections with San Angelo and Menard were available. Junction had Baptist, Christian, Episcopal, and Methodist Episcopal churches by 1881, when the latter was organized by Methodist circuit rider Andrew Jackson Potter. A Catholic church and a Church of Christ had come to Junction by 1933. By 1930 the town had incorporated, and the United States census of that year listed its population as 1,415. Junction was the chief shipping and commercial center of Kimble County, as well as a tourist resort and hunting center. In the mid-1940s the cedar-oil business developed and enhanced the economy, but the city's growth slowed. The population was 1,464 in 1950 and 2,593 in 1980. Junction continues to be the shipping and marketing center for Kimble County's livestock, wool, mohair, pecan, and grain production. It is also the hunting center for one of the state's leading deer-hunting counties. The town's other economic foundations include pecan processing, tourism, and a cedar-oil plant. Texas Tech University Center, a branch of Texas Tech University, is located in Junction. The center can accommodate 250 students and offers both graduate and undergraduate courses. Public school students are transported by bus from around the county to the Junction school, which has consolidated the rural schools of Kimble County. The Kimble County Library is also housed in Junction, as are a hospital and nursing home. Major celebrations in Junction include the Billie Sale and Parade in August and the Kimble Kow Kick in September. In 1990 the population was 2,654. That figure fell slightly to 2,618 in 2000." Named for its location at the confluence of the North and South Llano rivers. JUNCTION RIVER RENTALS: Outfitter (tubes), open 7 days a week, shuttle service. LLANO FARMS PECAN & RIVER COMPANY: 325-446-8271; 103 Park Rd 73, Junction, TX 76849. Outfitter (tubes), store. Located at the entrance to Llano River State Park. LLANO RIVER CAMPING: 325-660-2923; CR 314, Junction, TX 76849. www.llanorivercamping.com. 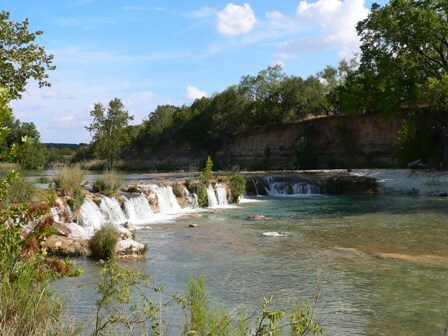 On South Llano River, 200 acres with cliff views, outfitter (tubes), campground (tents, cabins, RV sites), fishing, swimming. MEACHAM OUTFITTERS: 325-446-3192; 432-288-3656; 1214 Main, Junction, TX 76849. Outfitter (kayaks, canoes, tubes, paddle boats), shuttle service. Guided paddle trips on Llano River near the South Llano River State Park. (THE) OUTDOORSMAN, PEACEMAKER RIVER EXPEDITIONS & WEST TEXAS FLY OUTFITTERS: 325-446-6899; 325-446-2363; 126 Flatrock Ln, Junction, TX 76849. www.peacemakerriver.com. Within walking distance of the S Llano River. Outfitter (kayaks). PETE'S PECAN PATCH: 972-814-0213; 585 KC 312, Junction, TX 76849. A 1/2 mile of frontage on Main Llano River, great for swimming, tubing, fishing and kayaking. You can put in at Junction City Park and Kayak to here, or put in here and kayak to Yates crossing. Both are great 1/2 day trips. You will be the only guests so it is private and a great escape to nature. Rent converted RV that sleeps 7 under a covered picnic area with bbq pit, fridge, picnic table and fire ring. SOUTH LLANO RIVER CANOES & KAYAKS: 325-446-2220; Junction, TX 76849. www.junctiontexas.net/canoeing.htm. 6 mi S town on US-377 S, on South Llano River, outfitter (canoes, kayaks), shuttle service. TONY'S KAYAKS: 325-446-3360; 830-609-8329; 830-609-8836; 315 US-377 S, Junction, TX 76849. Rentals of kayaks, shuttle service. USED TO BE SONNY'S CANOES: 325-215-9376; 214 Patricia, Junction, TX 76849. www.utbsonnys.com. Located near the Flat Rock crossing on the South Llano River. JUNCTION GOLF CLUB: 325-446-2968; FM 2169 W, Junction, TX 76849. www.junctiontexas.net/golf.htm. Public, 9 holes, 2827 yds, par 35. City owned & operated. Local: Kimble County, 325-446-2620; Courthouse, 501 Main St, Junction, TX 76849. Local resources: Game Warden: Ball, Carter: 325-215-9129. Offices with Sheriff. TEXAS DEPT OF PUBLIC SAFETY (DPS): 512-424-2000; 5805 N Lamar, Austin, TX 78752. www.txdps.state.tx.us. Responsible for statewide law enforcement and vehicle regulation. HOFFMAN SERVICES: 830-928-3531; Junction, TX 76849. Road work, hauling. JUNCTION DEER PROCESSING: POB 12, Telegraph (SW of Junction), TX 76849. BON TON ROULET CABINS ON THE RIVER: 325-446-3154; Junction, TX 76849. 10 miles from town on US-377 S.
GOODMAN CABINS: 325-446-3870; Junction, TX 76849. S of town. JUNCTION/NORTH LLANO RIVER RV PARK: See RV section below. MESA CABINS: 325-277-1267; 4 mi outside nearby Roosevelt. KIMBLE COUNTY HISTORICAL MUSEUM: 915-446-4219; 2101 N Main St at Hospital Dr, Junction, TX 76849. Documents, tools and other relics from days of early settlers, and military artifacts. Farm & ranch tools; household items; guns; photography; clothing. Open: Mon-Fri, 9:30 am-noon, 2-5p Weekends by appointment. O.C. FISHER MUSEUM: Duplicate of Washington office of long-time congressman from this district displays memorabilia and gifts received. Open weekdays. Located inside the Kimble County Library. LLANO RIVER WATERSHED ALLIANCE: POB 725, Junction, TX 76849. www.llanoriver.org, Facebook. An organization of landowners and interested stakeholders whose mission is to preserve and enhance the Llano River and adjoining watersheds by encouraging land and water stewardship through collaboration, education, and community participation. ROTARY CLUB: www.rotary.org. Rotary is a worldwide organization of business, professional, and community leaders. Members of Rotary clubs, known as Rotarians provide humanitarian service, encourage high ethical standards in all vocations, and help build goodwill and peace in the world. TEXAS FARM BUREAU - KIMBLE COUNTY: 325-446-2561; 904 College St, Junction, TX 76849. CONCHOS AND CROSSES: 325-446-8558; 1409 Main, Junction, TX 76849. Ladies clothing, Jewelry, accessories, home decor, and a vast selection of crosses. GENERATIONS III: 325-446-2663; 911 Main St, Junction, TX 76849. Ladies clothes and unique gifts. SIMON BROTHERS MERCANTILE: 325-446-2604; 2 Main St, Roosevelt, TX 76874. www.simonbrothers.com. General store, hunting supplies, gas, post office, antiques, cafe. ABOVE & BEYOND SOUTH LLANO RIVER RV PARK & EVENT CENTER: 325-446-3388; 210 Cedar Creek Rd, Junction, TX 76849. www.southllanoriverrvresort.com. PECAN VALLEY RV PARK: 325-446-3065; 800-426-3065; 6720 W RR 1674, Junction, TX 76849. 7 mi W of town. SCHREINER CITY PARK: 325-446-3880; Junction, TX 76849. On S Llano River, swimming, tables, BBQ grills, pavilion (reservation), limited gazebo area RV camping.